Hope you are having a great week and enjoying Thanksgiving with your family and friends! 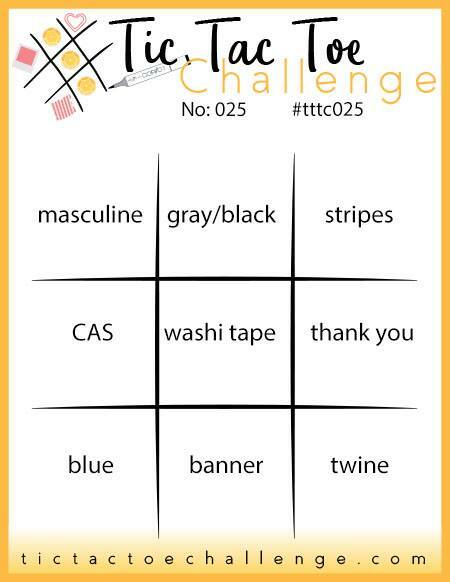 My inspiration card for the TTTC challenge is based on the top row: masculine - gray/black - stripes. 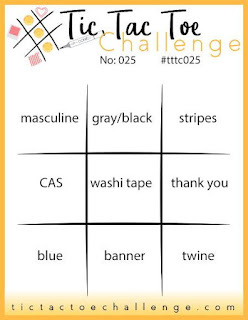 Also, be sure to visit the challenge (link above) and see what the rest of Design Team X has created this week to inspire you. 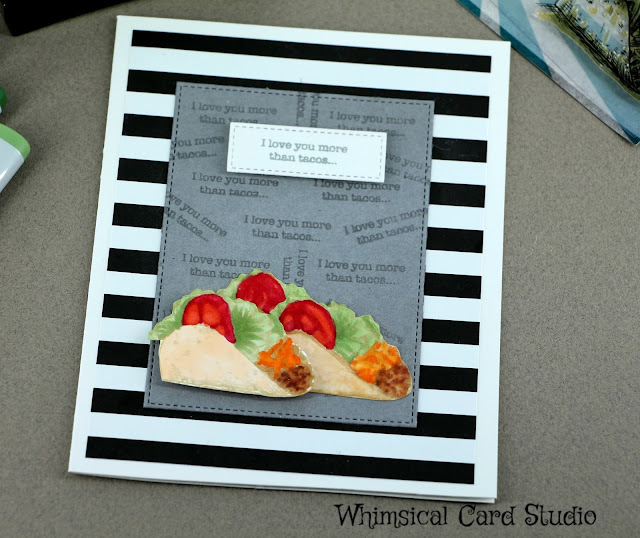 In the various forums and groups that I participate in about card making I often hear that making masculine cards is very challenging. Today I am sharing a few cards created with guys in mind, including one for a young boy. I subscribe to a monthly stamp of the month club at Brutus Monroe (not affiliated BTW) and get a small 2" x 3" stamp set for $5. I have really enjoyed the ones I've received over the last several months, and when I saw this week's board I knew which one of these sets I was going to use. The sentiment is just the kind of thing a guy might say. You know the type - they don't like to be mushy (like my brother) and find unique ways to express their love. So far several of the stamps I've received from this subscription have already become my go to's for guy cards. 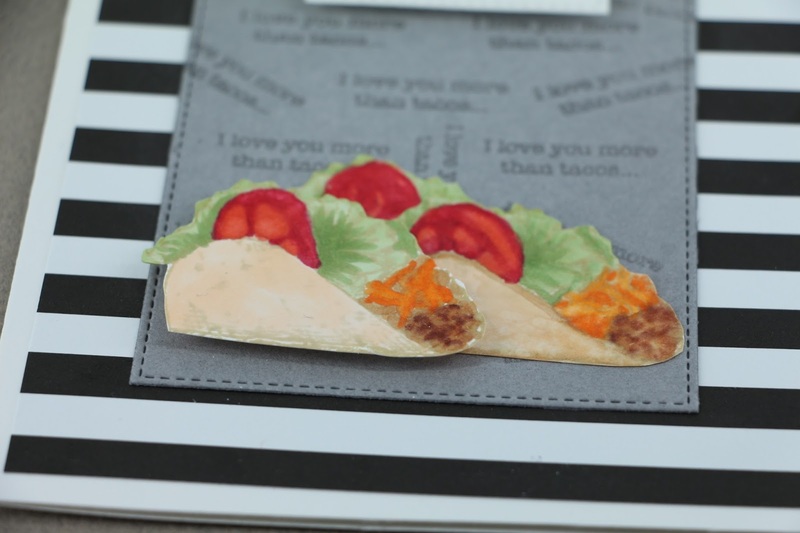 I stamped the taco three times onto Neenah solar white cardstock and colored with Copic markers. Then I fussy cut each one. I kept things simple with a base layer of black & white striped patterned paper and used a die cut square of gray cardstock on top of that. Since the sentiment is very small, I stamped it multiple times onto the gray cardstock with Versamark Dazzle ink (frost), which leaves a slightly shimmery finish. I stamped the sentiment onto white cardstock in gray ink and die cut it with a small rectangle stitched die from My Favorite Things. 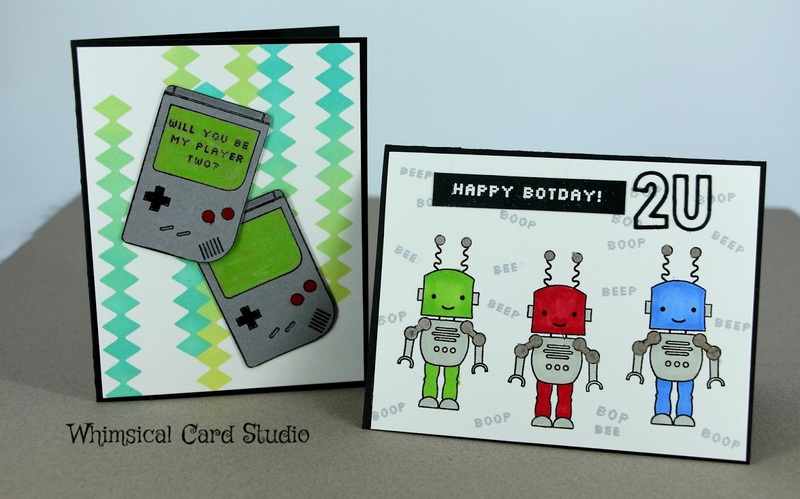 I used dimensional pop up dots under it before adhering to the gray card. 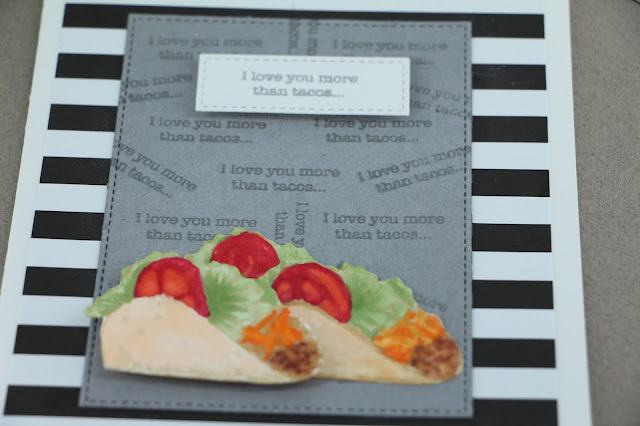 I placed two of the tacos down onto the gray cardstock and glued them in place. I added pop dots to the 3rd taco that I placed in the front of the other two and then put the layered panel on top of an A6 sized white card base (finished size is 4.5" x 6.25"). As mentioned earlier - here are photos of other cards that were made with Brutus Monroe stamps from the stamp of the month membership. 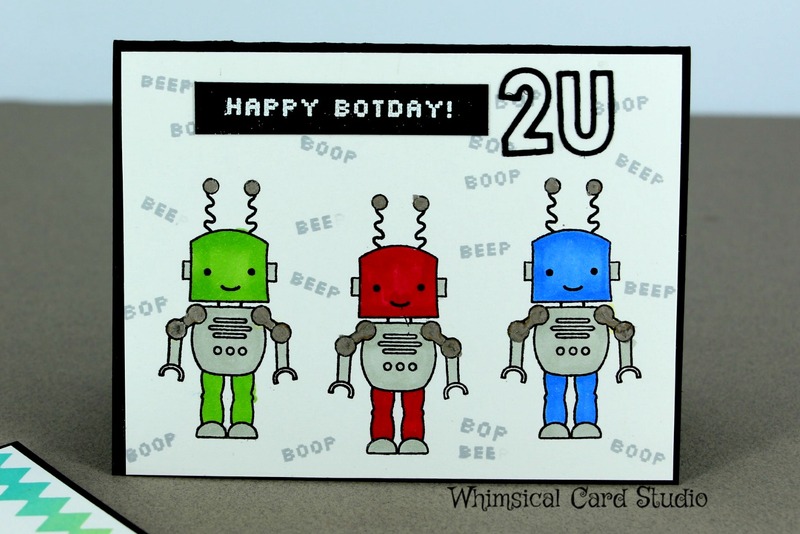 The robot card does have die cuts for part of the sentiment that are from Concord & 9th (the "2U" part). The card below has a background I made from using a Sizzix die. I cut the die into a piece of acetate a few times, then used it as a stencil to create the background by blending several Distress Oxide inks. 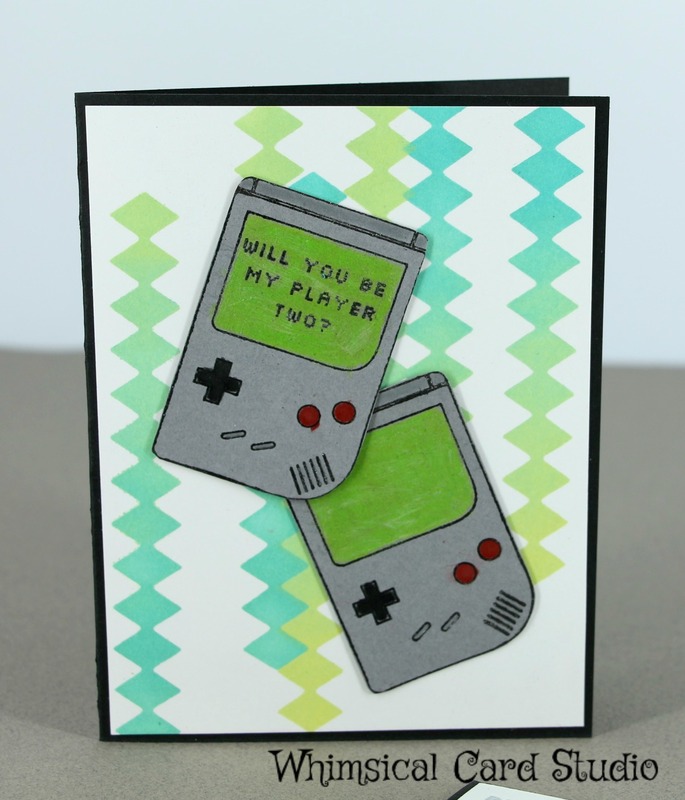 The game consoles were stamped onto gray cardstock, then colored in the buttons and screen with Prismacolor pencils. I blended them out with Gamsol for a smoother final finish. The background on the card below was created by using the little word stamps all over the white background with light gray ink. The robots were colored with Copics. If you are still reading at this point, thank you so much for stopping by today! If you enjoy reading this blog, please be sure to subscribe before you go. I just recently added the Blogger "follow" button on the sidebar and wished I had done this when I first started the blog. A great reason to follow now is that in January I will be celebrating my first blog-versary (my term for anniversary ha ha) and am planning some fun things (potentially a blog hop and GIVEAWAYS so STAY TUNED!!. If you prefer BlogLovin' as your reading platform I also have that button on the sidebar.